Macon, Georgia-The 17th edition of the Georgia Tandem Rally rolls into Macon, Georgia on Thursday, May 21. Over 200 tandem bicycle riders from 14 states and Australia will gather at the Macon Marriott City Center for three days of riding and socializing. The Georgia Tandem Rally last visited Macon in 2011, when it stayed on the west side of town near I-475. The rally&apos;s busy riding schedule begins with a remote start ride near Jeffersonville in Twiggs County. Options of 32-62 miles will take the riders through the corn and cotton fields on lightly travelled roads. Saturday&apos;s ride goes north towards Gray with options of 17-60 miles. The riders will be treated to lunch at the end of the ride at the Georgia Sports Hall of Fame, followed by an easy ride back to the Marriott. Sunday&apos;s ride features options of 26 and 36 miles to the east of Macon near Griswoldville. Planned social activities include a party at The Mill downtown as well as an ice cream social at the Douglass Theatre. The weekend will be capped off with a big banquet at the Edgar H. Wilson Convention Center. "We thank the people of Bibb County in advance for sharing their roads with the bicycle riders over Memorial Day weekend," ride director Eve Kofsky said. "This is a great opportunity for drivers to show some Southern hospitality to people from all over the country and give the cyclists at least three feet of room when passing." Conservative estimates are that the rally will pump about $75,000 into the Macon economy. "Cyclo-tourism is big business," Kofsky said. "It&apos;s a great way to see the state of Georgia at fifteen miles per hour. And it&apos;s a good reason for the people of Bibb County to wave at us with all five fingers of their hands!" The Georgia Tandem Rally began in 1999 and has been run by Eve Kofsky and Roger Strauss since its inception. Previous rides have visited Madison, Athens, Statesboro, Albany, LaGrange, Americus, Covington and Dublin. 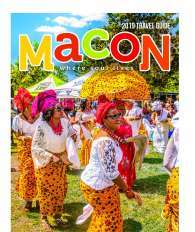 "Macon is a great location for us," Kofsky said. "It&apos;s right in the middle of the state, which makes it easy for our riders to get here. The facilities here are great and we hope to return in the future." For more information about the Georgia Tandem Rally, visit www.georgiatandemrally.com.